I have a "fancy camera" but I don't know how to use it. I rarely pick up my DSLR because I can take better photos with my iPhone. I'm great at photographing objects, but my toddler is always a blurry mess when I try to take a picture with my DSLR! The 5 Days to Better Photos FREE Course! Day 1 - What’s the deal with automatic mode? We'll discuss the truth about automatic mode, and have you on your way to being the BOSS of your camera, rather than letting it be the boss of you! Composition has to do with how we position our subject within the photo frame when snapping a photo. I’ll teach you how to fix the 2 BIG mistakes you’re probably making when it comes to composition! These two fixes alone will elevate your photography game big time! You’re probably seeking that beautiful blurry background that professionals get in their images, but maybe all you’re getting is a blurry MESS of a toddler in your photos, with hands ghosting through your picture. I’ll teach you how to fix that in this lesson! In this lesson, we’ll ditch the cheesy smiles at the camera, and talking about capturing candids - your first step in capturing beautiful photos of your everyday life! Think you need a bunch of fancy gear to get good photos? I’m debunking this long believed in myth about photographing, and finally letting you in on the truth about what it takes to get great photos! Mama, I've been in your shoes. It took me YEARS of trial, error, and random internet tutorials to finally understand how to use my DSLR. It wasn't until a few years ago that it finally CLICKED and I understood how to capture consistently beautiful photographs. 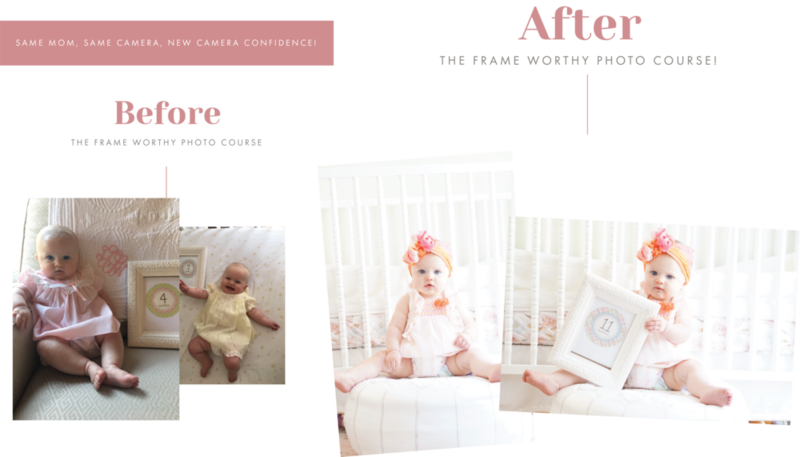 As a mom to a little girl who is growing all too fast, I'm on a mission to help mama's skip the frustrating trial and error stage, and teach them how to use their camera in a simple, easy to understand way. “Thank you so much for putting so much work and content into your 5 day e-mail course! It was fabulous and I learned so much. I found myself sitting taking notes like a college kid!" The 5 Days to Better Photos email course is a FREE email course to help you master a few basic principles so that you can see real, tangible improvements in your photography by the end of the week. I'm covering some of the basics of exposure and composition, and debunking some myths about gear that you won't want to miss (hint: it doesn't take a ton of expensive gear to take beautiful photographs!). I'm Courtney - a professional family and newborn lifestyle photographer, but most importantly, mom to a sweet baby girl named James. Since it's very beginning, my professional photography career has been dedicated to the beauty of family. Since the moment my daughter was born, I've been obsessed with documenting our life with beautiful photographs. Years from now, I envision my children home for Christmas, sitting in our living room and flipping through our treasured family "yearbooks", reliving their story and having tangible proof of our family's roots in love and faith. It is my passion and purpose to empower other mom's to be their family's storyteller, and to master their cameras to create a legacy for their family to enjoy for year's to come. The course starts as soon as you sign up! It's spaced out to give you 5 lessons for 5 days so you can absorb the information, give it a whirl, and be ready for the next day's lesson! This course is absolutely FREE! But just because it's totally free, doesn't mean it's not incredibly valuable! The lessons in this free email course will have you on your way to better photographs FAST. Since the course is delivered via E-Mail, you'll have access for as long as you have your email account! Simply refer back to past emails, or even copy and past the notes into a word processor to refer back to again and again. “Thank you so much for putting so much work and content into your 5 day email course! It was fabulous and I learned so much. I found myself sitting taking notes like a college kid!"